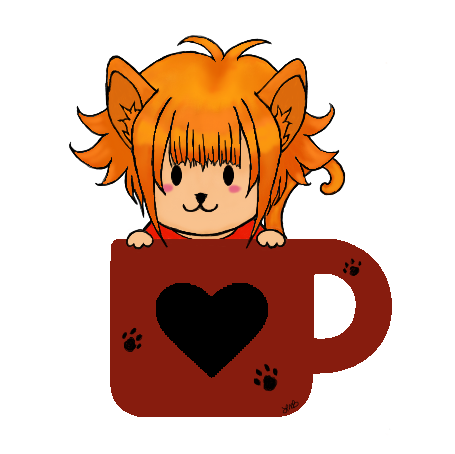 I now have a ko-fi page up! I don’t think that I’ve posted a lot of my artwork here, but that will change with my shift to doing more commissions. At the moment, I only have my clay work commissions up, but I will be adding illustrations as well. If interested in visiting my page, please click on the Junnycat above and he’ll take you there! It’s been a while since I’ve done a proper update to my etsy shop, but today I’ve added a few new items in time for the coming gift-giving season. First up is Loki in a Bottle. I designed and made this for a friend of mine and I decided to add it to the shop since I enjoyed making it. It also glows in the dark! Next is The TARDIS and the Snowman. This one was inspired by the Doctor Who Christmas special from 2012. I have a fondness for those creepy snowmen. You can’t really tell by the picture here, but I promise the snowman has his signature creepy grin! Up next is my redesigned holiday macarons. And lastly, my Queen of Hearts necklace! This one is inspired by the design of the Queen of Hearts from American McGee’s Alice: Madness Returns. 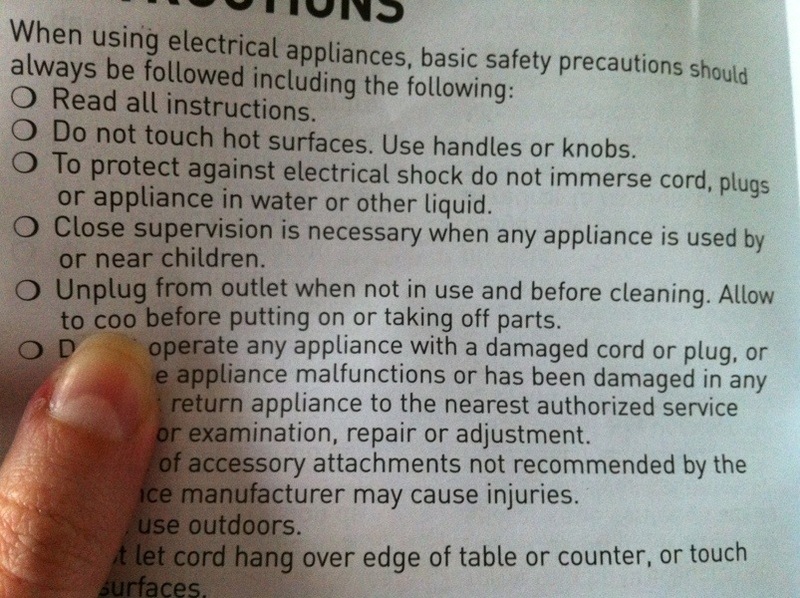 While it looks like it could prick you, I haven’t had any problems like that when I’ve worn it. I’ll most likely have another shop update later this week! And while I’m pimping my own items, I’ll pimp out my friend’s shop as well! She makes super cute crocheted items! I realized its been a while since my last entry, so I’m going to change that! I haven’t had too much to blog about lately and I’ve been busy making things for my Etsy shop, so that’s taking a lot of my time that isn’t work. Currently, there are only two items listed in the shop, but I plan to add more items over the weekend. The shop is named after the furry babies living with us, haha. I liked how nicely Phantom and Omi’s names matched up and since I couldn’t think of another name for the shop, PhantOmi it was! 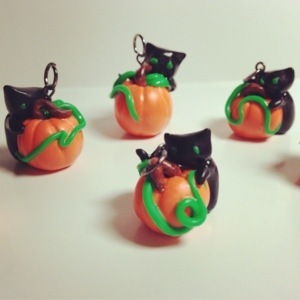 Right now, the items I have in the shop are Adipose earrings (those cute blobs of fat from a Doctor Who episode) and little pumpkin charms with black kittens. The Adipose are selling the most, so those are something that I think that I’ll always keep in stock, while the pumpkin-kittens are seasonal. On my upcoming days off work, I plan to start working on Christmas related items and custom requests for other Doctor Who related earrings. Stopped by Godiva yesterday to pick up two of the bakery truffles to try, plus the two pumpkin truffles they have now. 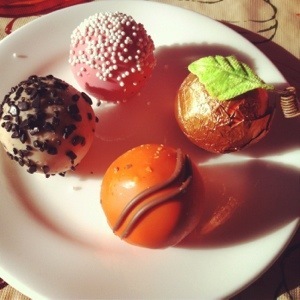 I ended up with Cookie Dough, Birthday Cake, Pumpkin Spice, and Pumpkin Cheesecake truffles. First, I tried the Birthday Cake. It’s good and certainly tastes like cake, but a bit too sweet for my liking. I tried the Cookie Dough as well, but again, it’s really good, but too sweet for me. The pumpkins, however, are always delicious and have a bit of spice to offset the sweetness. Anyway, I would definitely recommend the bakery truffles to anyone with a sweet tooth. I also stopped by Michael’s to pick up some clay. I’m trying out Primo! 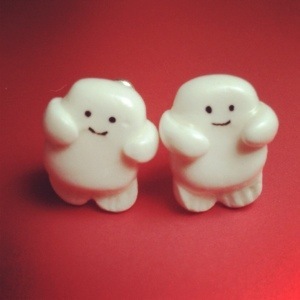 Sculpey to see how I like it. I picked out a good assortment of colors to mess with, so that should keep me busy for a while. I had meant to make things today, but my day got unexpectedly busy, so I’ll have to wait until tomorrow after work. Test baking done! I didn’t put much detail into these since they were going to be my test batch, but from now on I’ll be making better looking things. They didn’t turn out too bad for a first run. 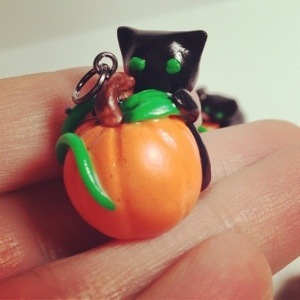 The cat came out the most burnt, but I think it looks more like it could be it’s coloring, haha. The muffin, made for a friend and designed after a doodle she did, actually looks muffin-like with the lightly burnt parts. Now that I have a better feel for how my toaster oven’s temperature spikes, I can time things better. The second one I put in turned out fine, however, I haven’t taken a picture of it yet. Expect to see more over the weekend! 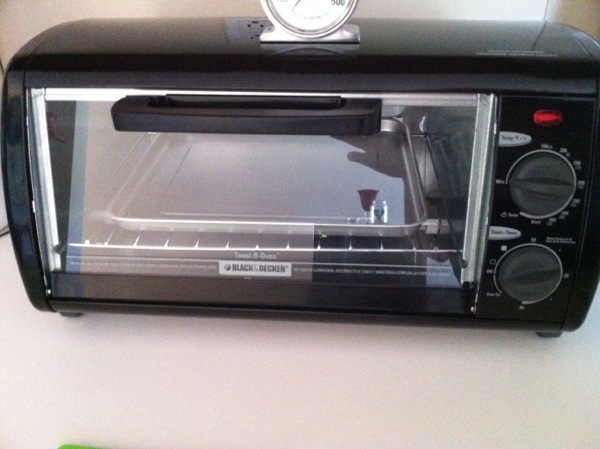 I bought a toaster oven today. This will only be used for my polymer clay projects, no food whatsoever. I already have about four things lined up to be baked in it, and I would have done so tonight, however I forgot to get foil, so that is tomorrow’s mission along with getting more Sculpey and Fimo. I’m currently using Super Scupley, but it’s old and very gummy once I’ve rolled it a bit. Old as in about 6 years old, so I’m due for new packets of clay. If all goes well in the making and baking process, I will be putting them up for sale in my Etsy. 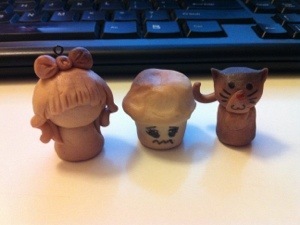 The sculptures look cute as they are now, so if they bake right, then they should turn out great. Oh, and one bit of amusement while reading the instructions for the oven..
Obviously meant to be “cool”, but the “coo” makes me think a phantom bird resides within.